Driving experiences around the UK with YOU at the wheel! Website and processes: 12 Nov 16 anon, 4/5 Good "Fine very good"
Your chance to drive an Aston Martin DB11, a Lamborghini Aventador or a Lamborghini Huracan. Friends and family welcome to spectate.Valid weekdays only. This experience will last a total of approx. 2 hours with approx. 2 hours in the vehicle. Your chance to drive one of our selection of Supercars; an ideal gift for the first time behind the wheel of a supercar, or even for a seasoned driver looking for a quick thrill. 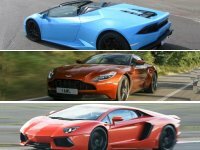 Choose from the following cars; Aston Martin DB11, Lamborghini Aventador or Lamborghini Huracan. The Aston Martin DB11 is a grand tourer coupe produced by Aston Martin. The DB11 is powered by an all-new 5.2L twin-turbo V12 engine. The engine produces 600 bhp and is a luxurious way to go fast. Back in 2012, Lamborghini announced what was to become the fastest ever mass production Lamborghini ever built - the Aventador! With Almost 700bhp from a 6.5 litre v12 - powering to a top speed of over 215mph, it remains one of the rarest and most exclusive Lamborghini's today. Note :20GBP upgrade payable on booking for Dunsfold Circuit. You must hold a full driving licence and legally be able to drive in the UK . Vouchers need to be booked 8-12 week in advance. Please wear appropriate clothing and footwear. Each voucher entitles one person	to participate in this experience. The voucher is transferable, which means that anyone can use it. The voucher remains valid for bookings for 12 months from the date of purchase. Please contact the operator	using the details printed on your voucher to arrange a date for your event. The voucher will have Elvington printed on it, but it can be used from..
"Many thanks for your emails and I am pleased to confirm that your introduction pack with the voucher arrived by recorded delivery this morning, less than 24 hours since placing the order. Thank you for such a high level of professional service! A very refreshing and rewarding shopping experience." Not suitable? We have a great choice of driving experiences for you to choose from at locations throughout the UK and Northern Ireland. We can also arrange driving sessions for your stag or hen celebration, or for corporate events. Alternatively, our fully flexible Hotseat Coupons make an ideal gift - your recipient can use them to purchase or part-purchase any experience on any of our sites.